Within just a few clicks and 3 steps you can create an online memorial. Once your memorial is created, you can add photos, videos, music. No computer skills are required. Just let yourself be guided and follow the 3 steps to create an online memorial. How much does a memorial website cost? During the 5-day trial, you will have access to all the features of the "Premium" plan. At the end of this period, you will be asked to subscribe to the "Premium" plan to keep the memorial on line. Go to the "Features" section to see our prices and functionnalities. How long will my memorial stay on line? At the end of the trial period, whatever formula you choose, your memorial will remain online forever. How can I edit my memorial? To edit your memorial connect using the login credentials that have been sent to you by email when you registered, then go to the "manager" of your memorial. To add, delete photos, video, music, log in using the login credentials that have been sent to you by email when you registered, then go to the "manager" of your memorial. Can I edit the colors and the appearance of my memorial? Yes of course, you can chose between dozains of themes to customize your memorial. You just need to log in using the login credentials that have been sent to you by email when you registered, then go to the "manager" of your memorial. Who can visit my memorial? You decide yourself. If you choose to have a public memorial, then everyone can visit your memorial. If you choose to have an "only family and friends access" memorial, only the persons you have added to your friends list can visit the memorial. If you choose to have a private memorial, you are the only one who can visit it. How can my relatives and friends visit online memorial? Sent the internet address of your memorial to your relatives and friends so they can visit it. If you have chosen to restrict your memorial to your family and friends, they must be added to your friends list to be allowed to visit the memorial. In order to do this, you must send them the access code you will find in the "manager" of your memorial, in the "General information" section. We have set up a special "invite family and friends tools" to do this for you. You will find this tool in the "manager" of your memorial. The best is to use it and your relatives and friends will be sent an email containing all the instructions they need to visit your memorial. How can I inform my family about the creation of my memorial? You can do this from the memorial page or from the "manager". From the memorial page, click on one of the icons of the block "share with your family and friends". From the "manager" of your memorial, go to the "invite family and friends" section. Who can post a thought or light a candle on my memorial on line? We are deeply involved in preserving you privacy and in preventing your memorial from being invaded by "spam" messages. So, even if you have decided to set your memorial as "public", only registered members can post their thoughts and light candles on the memorial. The registration is free and it takes them a few seconds to create an account. If your memorial is "only family and friends access", only the members that you have added to your friends list are allowed to post. If your memorial is private, then you are the only one who is allowed to post thoughts or to light candles. I don’t have an online memorial but I want to post a thought or light a candle on another memorial. In order to post a thought or light a candle on this memorial, click on the "light a candle" or "share a thought" button. You will be asked to click on "create a free account" to be allowed to post. Can I create several memorials? You can create as many memorials as you want. Can I access to my memorial from other computers? You can access to your memorial from any computer, smartphone or tablet. 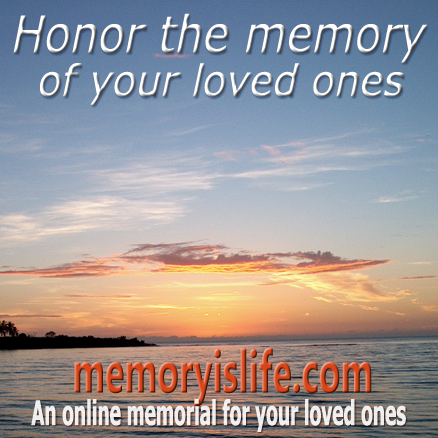 On MemoryIsLife home page or from your online memorial page, click on "login" and select "lost password". An email will be sent to you containing the instructions to create a new password. For safety reasons we do not store your password, so you must create a new one if you have lost or forgotten. How to access my memorial from my mobile phone? You just need to type the address of your memorial in the address bar of the browser of your smartphone or tablet. The access from mobile is available to trial or "Premium" memorials only. How to use MemoryIsLife on my mobile phone? Same as above. You just need to type the address of your memorial in the address bar of the browser of your smartphone or tablet. The access from mobile is available to trial or "Premium" memorials only. If you do not choose to subscribe to one of our formulas, the memorial will be discarded at the end of the trial period. Your free account in the community will be still be available. I want to switch from \Basic" formula to "Premium" formula. Go to the "manager" of your online memorial and click on "upgrade to premium". I want to switch from "Premium" to "Basic" formula. At anytime you can unsubscribe from the "Premium" annual subscription from the "manager" of your online memorial. At the end of the subscription period your memorial will switch to "Basic" formula. If you have chosen the payment option "once for all", your memorial will never return to the "Basic" formula. How to choose between "Basic" formula and the "Premium" formula? The "Basic" formula allows you to keep track of the memory of your loved ones(tell their story, the hightlights of their life, introduce a loved one, post some photos ...) forever. With the "Premium" formula you can keep the memory of your loved ones coming regularly pay tribute. This formula allows also to share this memory with your family and friends, who can also light candles and share thoughts. How to remove my memorial on line? What is the MemoryIslife community? The MemoryIsLife community allows you to create relationships with other members. You can share your experience, support members, give and receive advices to help deal with the loss of a loved one by joining the forum or writing in your mourning diary. Why should i join the MemoryIsLife community? The MemoryIsLife community will help you to build relationships with people who live the same experience that you live, give and receive support, share your experience. How much does cost the MemoryIsLife community registration? The MemoryIsLife community registration is free. I don’t want to create an online memorial, but I would like to join the community?. You just have to create a free account: from an online memorial page, click on "community" on top of the page and choose "create an account". How can I create a mourning diary? To create a mourning diary you must create a free account. Log in and select "write in my mourning diary". How to join the forum ? You only need to create a free account. Log in and click "join the forum". The Terms and Conditions Of Use are available from the link at the bottom of the page.